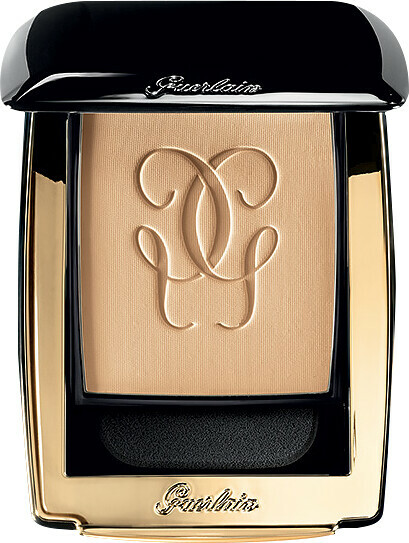 Treat your skin to the inimitable glow of the Guerlain Parure Gold Compact Foundation SPF15, a perfecting, luminous base. The Parure Gold Compact Foundation blends seamlessly with the skin to offer flawless colour and radiance. Inspired by the glow of pure gold, the powder minimises the appearance of fine lines and tiredness for a luminous result. The reviving base is infused with dual-faceted ‘gold’ pigments, which diffract light and reflect each other to brighten dark areas, erasing signs of fatigue and enhancing the complexion. The innovative formula combines the exceptional ingredients of collagen, elastin booster and the aromatic resin of Myrrh to revive the complexion and revitalise the skin. Touching up your foundation becomes a moment of pleasure thanks to the ingenious sliding case, which features a wide-angle mirror and sponge for travel-friendly ease of use. 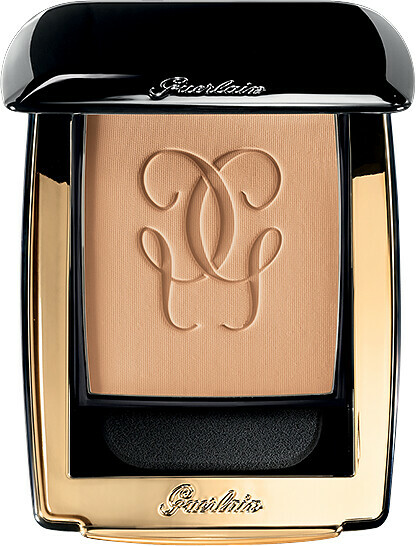 Use alone for a lightweight and radiance-boosting base, or as a setting powder for a flawless finish. TALC, SYNTHETIC FLUORPHLOGOPITE, BORON NITRIDE, ETHYLHEXYL METHOXYCINNAMATE, MICA, NYLON-12, DIPHENYL DIMETHICONE/VINYL DIPHENYL DIMETHICONE/SILSESQUIOXANE CROSSPOLYMER, MAGNESIUM MYRISTATE, PENTAERYTHRITYL TETRAETHYLHEXANOATE, TITANIUM DIOXIDE, ACRYLATES/STEARYL ACRYLATE/DIMETHICONE METHACRYLATE COPOLYMER, PHENYL TRIMETHICONE, ETHYLENE/ACRYLIC ACID COPOLYMER, SILICA, DIMETHICONE, PENTYLENE GLYCOL, SODIUM DEHYDROACETATE, TITANIUM DIOXIDE [NANO], CAPRYLYL GLYCOL, HYDROGEN DIMETHICONE, PARFUM (FRAGRANCE), PROPYLENE GLYCOL DICAPRYLATE/DICAPRATE, STEARIC ACID, ALUMINUM HYDROXIDE, BUTYLPHENYL METHYLPROPIONAL, LINALOOL, CITRONELLOL, COMMIPHORA MYRRHA RESIN EXTRACT, AQUA (WATER), ALPHA-ISOMETHYL IONONE, BHT, BENZYL BENZOATE, GERANIOL, LIMONENE, ACETYL HEXAPEPTIDE-8, [+/- : CI 77163 (BISMUTH OXYCHLORIDE), CI 77491,CI 77492,CI 77499 (IRON OXIDES), CI 77891 (TITANIUM DIOXIDE)]. GUERLAIN Parure Gold Radiance Powder Foundation SPF15 - Refillable is rated 5.0 out of 5 by 1.